Today is National Voter Registration Day and, with all that is at stake November 6th, we want to provide you with the tools, voter information and deadlines to cast your ballot in your state. We are all paying the consequences for those who did not go to the polls in 2016. Help take back our democracy. If you don't vote, you don't have a voice. In 49 States and the Territories, an eligible citizen must be registered to vote. North Dakota, which does not require voter registration ahead of an election, is the exception. Check your status, register & commit to vote via the DNC's Voter Reg Campaign! 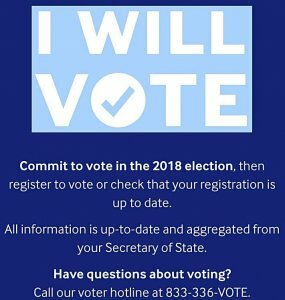 There are a number of ways to register to vote, in person, by mail or online at your local elections office, Department of Motor Vehicles or public assistance agencies. A citizen may also register through a third-party voter registration organization such as a political party or the League of Women Voters. In most states there is a cutoff for registration somewhere between 3 and 30 days before the election, but 17 states and DC offer same day registration under specific circumstances. To qualify to vote, you must be a US citizen, legal resident of the state where you are registered, and be 18 years old on or before election day. Depending on the state, court-ruled mental incompetency, a felony conviction or current incarceration may disqualify you. Citizens voting from abroad cast their ballots for candidates in the US state where they are registered. Please repost and share this with family, friends and colleagues! *Dates vary by source. If there are updates or corrections, please let us know. DemList: Free Tix through DemList! DemDaily: The Endorsement Race: Elected, Labor, Orgs & Celebs!